Advertisements on Stack Overflow are usually the only place I know of where they are non-intrusive and still more or less relevant. I encountered this job ad for a few days where a particular company in my country (I deliberately only show the company name in the image) advertises with clickbait job titles. Clickbait rarely describes anything accurately and is mostly used to drive clicks to increase ad revenue. It seems pretty counterproductive in this case, and it personally annoys me to see clickbait links on Stack Overflow. It makes Stack Overflow look like one of those many cash grab websites without any depth or real content out there. I know I can block companies, and I have done so in this case, but I would like to ask if Stack Overflow can vet these kinds of advertisements and prevent these kind of job adverts from showing in the first place. N.B. Apparently someone flagged this question as a duplicate of this question. While the answers may or may not be relevant, this question is obviously not about caps in a job title and should thus not be closed as a duplicate. Since nobody else has said it yet, I would argue this should be stopped. The reason is that the only incentive I can see not to do this is if a HR department thinks it is more economic to let the criteria of "the right people haven't happened to see this" (which is overcome by clickbait) decide their initial filter, rather than doing whatever initial filter they like. That filter could still be automated & cheap, and yet yield better results in their eyes. Based on that, at least for bigger companies with more ambitious HR departments I can't see why they wouldn't all eventually go down this road if it's not policed. 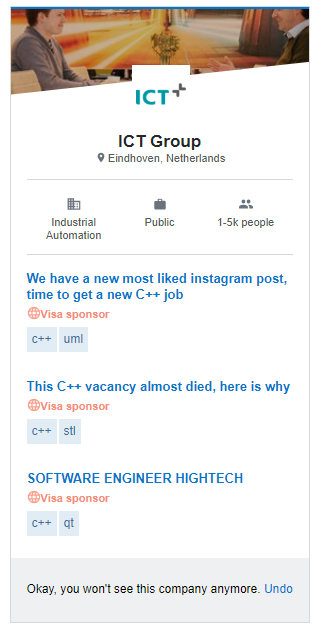 So unless StackOverflow wants a notable amount of job ads to become annoying clickbait - I can see that some people might just not care - then this shouldn't be allowed. But that's just my opinion of course. This is sarcasm. A parody of clickbait titles. This is their take at humor. Actual clickbait would have baited you. This already says what it is. It's a C++ vacancy. With a funny title to get noticed in the crowd of boring "C++ Developer" titles. Granted, sarcasm is banned by the CoC, but do we really need to squeeze the last bit of fun and humor out of SO? While I share your disdain for clickbait titles, this particular case is tricky. What follows is actually a pretty thorough and relevant description of the role, the skills they’re looking for, and info about the company. Their listings aren’t misguiding users or maliciously trying to get users to apply. Is this effective? Well, it depends. It comes off cheeky at best, off putting and unprofessional at worst. Using humour in job descriptions is always a dicey subject since it can easily backfire. As some of the folks here pointed out, it gives you a glimpse into the company culture. Some users will find it funny, others won’t. Is this malicious or SPAM? No, I wouldn’t go that far. It looks like they’ve put in the effort to write a comprehensive listing and attempted to stand out from the crowd (for better or for worse). There’s nothing misleading in the job description and the roles are legit. Is this an epidemic? Absolutely not. We don’t see any evidence that clickbait titles are proliferating. And if this just rubs you the wrong way? Dismiss the company or listing. You’re always in control of the content we show you, and the feedback helps us get better at filtering and targeting content. From a Job advertisement perspective - I think it's fine. Not because I like clickbait, but because their choice of title is representative of their company and culture. I would have had the same reaction as you, this company is advertising itself as being highly unprofessional and as I look down on people who click on this sort of stuff (let alone the people who create it), I can tell from this advertisement that this job isn't meant for me. Being able to discern when you aren't going to be a fit for a company is a very important part of the job hunting/advertising process. The thing that's not so fine about it is that StackOverflow is a question/answer site. It happens to do job stuff on the side, but that's not why people come here most of the time, if at all. This means that people who come here for their quick copy-paste answer are going to see stuff like this on the side, and not realise that this message is representing a company other than StackOverflow. In other words, these ads make StackOverflow itself look unprofessional. Therefore I think it's in StackOverflow's interest to discourage this sort of advertising. I don't think how it is harmful for any member of the community. You are still free to look at the job advert details or not, and provided this an actual job position advert behind this, I don't think there is any concern to have or action to take. The companies should have some freedom for creativity, as already noted, and if some counter-productiveness should arise, this is on their side, in my opinion. Currently, I doubt that a "click bait job advertisement disease spread" is ongoing. Not the answer you're looking for? Browse other questions tagged discussion jobs . What does “(m/f)” mean in job description titles? Is the salary range in the job advertisements real or an estimation?